Turkey's prime minister has accused Russia of attempting "ethnic cleansing" with its air strikes in northern Syria. Ahmet Davutoglu said Russia's campaign had targeted Turkmen and Sunni communities around the Latakia region. Relations between Ankara and Moscow have plummeted since Turkey shot down a Russian warplane on the Syrian border. President Vladimir Putin has asked UK specialists to help analyse the flight recorder in a phone conversation with PM David Cameron, the Kremlin says. Turkey insists that its F-16 fighters shot down the Russian Su-24 on 24 November because the bomber had trespassed into its airspace. Russia denies this. 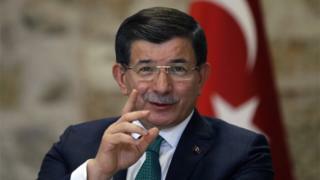 "Russia is trying to make ethnic cleansing in the northern Latakia [region] to force [out] all Turkmen and Sunni populations who do not have good relations with the [Syrian] regime," Mr Davutoglu told reporters in Istanbul on Wednesday. He said Russian air strikes were "strengthening" the so-called Islamic State (IS) group in Syria. Russia says its bombers are attacking IS and other jihadist groups in Syria, helping the government forces of President Bashar al-Assad. However, Western analysts and Syrian rebel sources say most of the Russian bombing has targeted anti-Assad groups who are not jihadists. Appearing on television with the orange metal box from the Su-24, President Putin said the recorder it contained would help prove the Russian jet's flight path and position. "Whatever we learn won't change our attitude to what the Turkish authorities did," he said. "We used to treat Turkey not only as our friend but also as an ally in the fight against terrorism. Nobody expected this low, treacherous stab in the back." In a statement on Wednesday, the Kremlin said Mr Putin had discussed the conflict in Syria with Mr Cameron. It said the two leaders had talked of ways to co-operate in the fight against IS militants and other terrorist groups. The UK joined the US-led air strikes against IS in Syria last week. The Kremlin statement said that Mr Cameron had "expressed his condolences over the destruction of Russia's fighter plane in Syria". "Mr Putin invited British specialists to take part in decoding the data from the downed Su-24 plane's flight recorders," it added. Russia has announced wide-ranging sanctions against Turkey - a Nato member - because of the border clash, including an import ban on Turkish fruit, vegetables and some other foods. Russians can no longer go on package holidays to Turkey - until this month the top foreign destination for Russian tourists.